Barowwsoe2Save is a potentially unwanted program that masquerade as a tool to block ads from online video web site. In reality, this brings annoyances and tries to evade security programs by showing random name like Browse2Save or BrowsetoSave. It may appear differently on browser’s extension and add/remove program of Windows. Files and other malicious items dropped on the system also possess irrelevant file names. Third-party programs and freeware are the main cause of Barowwsoe2Save infection. It is normally wrapped to free programs that you can obtain from various servers at no cost. On some instances, this adware can be acquired by visiting malicious web pages put-up to deploy Barowwsoe2Save on purpose. Links from spam email messages and social media sites are other means to spread this adware. Google Chrome, Mozilla Firefox, and Internet Explorer browsers are the main target of Barowwsoe2Save. Users of these programs are most vulnerable due to some security exploits currently present on such browser programs. Thus, updating the software to the most recent version reduces chances of being attacked by Barowwsoe2Save. 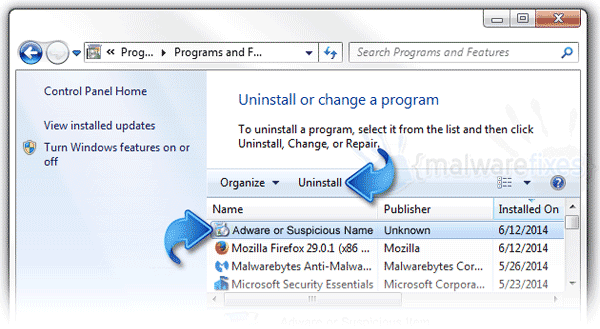 It is advice to remove this harmful program right away before it can cause severe damage on the computer. As a matter of fact, Barowwsoe2Save can steal sensitive data from user when it is left intact on the system. It monitors browsing habit and logs most of the online activities on the computer. 5. Proceed with the removal of malicious files and other items on the computer that is linked to Barowwsoe2Save. 3. Look for and remove Barowwsoe2Save entry. The adware may also use distinctive name like Browse2Save or BrowsetoSave. If not present, look for any suspicious labels that was installed recently. 4. It searches for presence of harmful programs, plug-ins, add-ons, or any data that were found malicious and linked to Barowwsoe2Save. You need to Clean all items detected by this tool. After the previous scans, you may have deleted Barowwsoe2Save from the affected browser. This next step will ensure that no more module of adware will be left on the browser. This free tool scans and checks the browser for unwanted add-on and extension, and if found, Avast Browser Cleanup will give you a report and suggestion. 4. Avast Browser Cleanup will confirm before it permanently deletes the add-on. Please click Yes to proceed with the removal of Barowwsoe2Save on the affected browser.